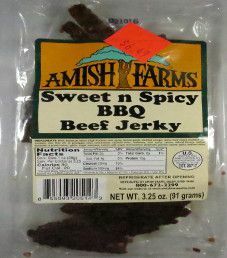 This Amish Farms brand name is distributed under the same name of Amish Farms, and are located in Salem, Ohio. Unfortunately, there is not much information that we can provide about Amish Farms. Both their web site and toll free phone number are no longer in service. That normally tends to indicate that the company has gone out of business. However, we are not convinced of that, where their jerky is still currently for sale in multiple states. Ingredients: Beef, Barbecue Sauce (High Fructose Corn Syrup, Tomato Paste, Distilled Vinegar, Water, Food Starch Modified, Salt, contains less than 2% of Pineapple Juice Concentrate, Caramel Color, Molasses, Corn Syrup, Spices, Natural Flavors, Sodium Benzoate (a preservative), Garlic, Sugar, Dextrose, Celery), Salt, Sugar, Monosodium Glutamate, Paprika, Spices, Garlic, Sodium Nitrite. The liquid marinade consists of only barbecue sauce. It is disappointing to see that the highly processed unhealthy sweetener high fructose corn syrup (HFCS) is the first ingredient listed by weight in this barbecue sauce. Corn syrup is also used, where corn products have no business being in jerky. There are healthy ingredients added such as paprika, spices, and garlic. While a nutrition facts table is provided, oddly, the sugar level is not noted. Being a sweet based flavor, the sugar level is probably on the high side. The salt level is extremely high at 580mg of salt per 28 grams of jerky. Our preference is 350mg of salt or less. This jerky does use unhealthy sodium nitrite as a preservative. 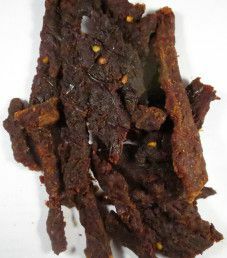 This jerky also uses the unhealthy flavor enhancer monosodium glutamate (MSG). These strips are medium sized, and are sliced to a medium thickness. This texture is great, which is almost soft and tender, but not quite. That results in jerky that is fairly easy to chew. 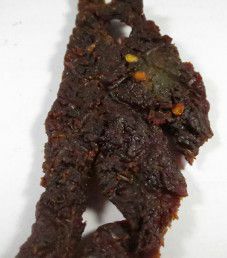 There are no visible signs of fat, and handling this jerky does leave a small amount of oily residue on your fingers. The first taste detected is a slightly sour tomato taste. There is a moderate sweet taste, a good mild garlic level, and a light paprika taste. While the spiciness is not all that noticeable as you chew on a strip, the heat definitely sneaks up on you. On a heat scale it may rate a 2 out of 4, possibly even more. There is some natural beef flavor, although the tomato and sweetness tends to drown it out. Overall, this is a tasty flavor. This 3.25 ounce/91 gram bag cost $6.49, which works out to $1.99 an ounce. That rates as an average price. This jerky is recommended from a taste perspective, but not so much from a health perspective. This plastic bag only has a label affixed to the front, and nothing on the back. The Amish Farms logo is a tree in between the words Amish and Farms. There are no facts or slogans printed on this bag. Most bag categories are covered. Missing is that the bag is not resealable, and there is no blurb printed about this jerky brand and flavor. Admirably, a toll free phone number is provided for customer inquiries, although it currently is out of service. I love the fact , my jerky has the high fructose corn syrup and salt… I’m so sick and tired of all of my favorite foods , becoming so low fat, gluten free , no sugar or salt and have no flavor, that it tastes like cardboard.. 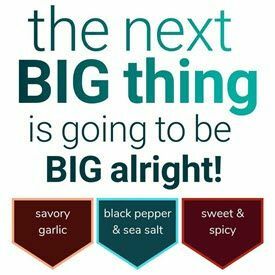 I don’t have a weight problem or health problems … why do I have to do without… I love the fact it’s all natural and its a name u can trust, unlike other companies.. not naming other name brand companies slim jim, Tyson etc.